Discomfort during use: a stinging sensation may occur when the gel formulation is left on the skin. This stinging sensation will fade within 10-15 minutes after application. Scars and nerve damage: this will only occur from careless use caused by not following the instructions on the information leaflet. Never use the Wartner Verruca & Wart Removal Pen on healthy tissue, as TCA is a highly corrosive agent that will damage normal skin. In case the wart is very small and the treatment is maintained too long or too frequent, TCA may cause peeling of the deeper layers of the skin. If that occurs, the treatment should be immediately stopped. Thanks to natural regenerative properties of the skin this damage is not permanent, and new & healthy skin will form. Can I let the area I have treated get wet? Yes. You can shower and swim after treatment with Wartner Verruca & Wart Removal Pen. Where can I buy Wartner Verruca & Wart Removal Pen? You can buy the Wartner Verruca & Wart Removal Pen at your local pharmacy. Who manufactures the Wartner Verruca & Wart Removal Pen? The Wartner Verruca & Wart Removal Pen is manufactured by medical brands, Veembroederhof 96, 1019 HC Amsterdam, the Netherlands. Make sure that the area stays clean. Do not pick at or scratch it. TCA treated skin may become hard (dead skin cells forming a callus). Thick skin can be carefully removed using a file during a bath or shower. In order to protect healthy skin around the treated wart, white petrolatum cream can be applied, or a plaster can be used. If the treated wart or verruca is on the exposed/frequently used spot (like fingertip, joint or sole of foot), the treated area can be protected with a plaster. What should I do if the wart doesn’t disappear after 4 weeks? If the wart or verruca doesn’t significantly decrease in size after 4 weeks, please consult your doctor. The wart or verruca may disappear from the first week. On average, it takes between 1 to 4 weeks before the wart or the verruca disappears. Can the Wartner Verruca & Wart Removal Pen be used by pregnant women? Yes, the Wartner Verruca & Wart Removal Pen can be used by pregnant and breast-feeding women. However, consult a doctor before use. Is it dangerous to use Wartner Verruca & Wart Removal Pen to treat children under four? Do not use Wartner Verruca & Wart Removal Pen to treat children under the age of four. Can the Wartner Verruca & Wart Removal Pen be used to treat children? The Wartner Verruca & Wart Removal Pen is suitable for children over the age of four. Who can use Wartner Verruca & Wart Removal Pen? The Wartner Verruca & Wart Removal Pen may be used by most adults. You can also use the Wartner Verruca & Wart Removal Pen to remove warts and verrucas on children over the age of four, but the treatment must be carried out by an adult. If you are diabetic, pregnant and/or breast-feeding, please consult a doctor before using Wartner Verruca & Wart Removal Pen. Always consult a doctor if the stinging sensation does not disappear or if other complications occur through using Wartner Verruca & Wart Removal Pen. Using the Wartner Verruca & Wart Removal Pen may cause some discomfort (transient tingling, burning sensation). In case of small warts, there is higher chance of wounding or discomfort. Therefore the application should be limited to 1 time a day. Always use the Wartner Verruca & Wart Removal Pen very carefully and accurately. If you’re not careful, scars and minor skin damage may occur. How do I use the Wartner Verruca & Wart Removal Pen? When the Wartner Pen is used for the first time, it is necessary to fully turn the dial on the top of the pen clockwise several times to load the gel into the brush tip until the first drop is visible. 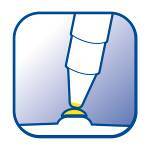 Multiple turns might be needed as the gel is stored at the top of the Pen (to avoid leakage prior to first treatment). Let the gel dry for 10-15 minutes before putting on clothes or shoes.The Wartner Pen formula is very concentrated and only one drop is needed per application. Carefully cover the entire surface of the wart (or verruca) and not the healthy skin surrounding it. Once the treatment is completed, carefully clean the pen with a tissue before storage. After applying the TCA gel and let it dry for 10-15 minutes, you could experience some discomfort when pressure or friction occurs on the treated area. You may find it helpful to protect the sensitive area with a comfort plaster which is widely available for purchase. Comfort pads not included. How often may I use Wartner Verruca & Wart Removal Pen Pen? How long should I leave the gel on the wart? It depends on the size of the wart or verruca (see instruction leaflet). 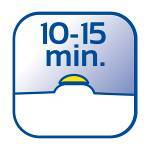 Usually, 10 to 15 minutes is enough for the TCA to be absorbed on the wart. How many times should I turn the twist-and-turn wheel before the first drop of TCA is released? When the Wartner Verruca & Wart Removal Pen is used for the first time, it is necessary to fully turn the dial on the top of the pen clockwise to load the gel into the brush tip until the first drop is visible. Several full turns might be needed as the gel is stored at the top of the Pen (to avoid leakage prior to first treatment) Do not turn the dial more than the amount of times necessary to release 1 drop of formulation, as this may result in over-dispensing of TCA and smearing on normal skin, which might cause severe irritation of the area. Is the Wartner Verruca & Wart Removal Pen difficult to apply? No, the Wartner Pen should be applied with precision, but it’s not difficult. The information leaflet explains exactly how you should apply Wartner Pen. Will I get a scar from using the Wartner Verruca & Wart Removal Pen? If you correctly follow all the directions in the instruction leaflet, using the Wartner Pen will not result in scarring. It is important to use the product exactly as instructed as overexposure to the formula could cause temporary burning, temporary pain, mild temporary ulceration and temporary discoloration of surrounding skin. Does TCA acid work faster than Salicylic Acid? Yes, TCA gel results in an ongoing peeling off and faster removal of the wart/verruca. Works 3 times faster then conventional liquids and gels and is effective from just 7 days. The effects (keratinisation and peeling off the skin) are visible soon after the first round of treatment (4 days with 2 daily applications). SPCs of traditional OTC wart & verruca treatments based on salicylic acid tend to indicate daily usage and a treatment time of up to 12 weeks. According to a pooled-analysis of 16 different clinical trials assessing the efficacy of salicylic acid treatments, the mean cure rate with salicylic acid treatment for removal of warts is 52%. In the same pooled analysis, it is recommended for trials to follow-up at a period of 12 weeks. Another controlled trial assessing the efficacy on warts of a treatment with salicylic acid (40%) applied during 13 weeks showed a cure rate of 24%, wheareas Wartner Wart Pen offers a complete removal up to 65% of treated warts & verrucas only after 4 weeks. How does TCA gel work compared to salicylic acid? TCA is scientifically proven to have a long lasting peeling effect on the wart, which allows a continuous action on the wart. It destroys the HPV virus. The pH rate of TCA= 1.9 whereas salicylic acid has a pH rate of 2.4, which means that TCA is a stronger acid than salicylic acid. Wartner Verruca & Wart Removal Pen is in gel format while salicylic acid compositions are generally in liquid form. The gel combined with the innovative applicator allows a more precise application on the affected spot without too much invasion of the healthy skin around it. What clinical data do we have? Is Wartner Verruca & Wart Removal Pen safe to use? Yes, the Wartner Verruca & Wart Removal Pen is safe to use if you follow the instructions carefully; however we do not advise use on children under the age of four. It is CE marked and classified as a Medical Device, which conforms to European guidelines (Council Directive 93/42/EEC amended by 2007/47/EC). The Wartner Verruca & Wart Removal Pen has been assessed by several scientific and medical experts as being a safe method for the removal of warts and verrucas. Will using Wartner Verruca & Wart Removal Pen hurt? TCA is a corrosive agent and causes skin peeling within 10-15 minutes. Large amount of TCA gel might cause a slight tingling sensation that should disappear quickly. If applied on the thin, damaged or sensitive skin, TCA may cause burning or a painful sensation – but the sensation is transient and should disappear within few minutes. If painful sensation persists the excess of the gel should be immediately cleaned out with water. How does the Wartner Verruca & Wart Removal Pen work? The Wartner Verruca & Wart Removal Pen is a medical device for treatment of common warts and verrucas. The pen applicator contains a new highly concentrated wart & verruca removal gel based on the traditional acid method. The TCA gel eliminates warts or verrucas by topical chemical eradication action. The gel induces the peeling of the keratotic tissue of the wart (or verruca) and allows the destruction of the causative virus. After wart (or verruca) desquamation, the skin will regenerate. What are the components of the Wartner Verruca & Wart Removal Pen treatment? Wartner Verruca & Wart Removal Pen contains a gel formulation based on Trichloroacetic Acid (TCA) in a easy to use pen applicator with a twist-and-turn mechanism to dispense the correct amount of gel to be applied on the wart (or verruca). When should the Wartner Verruca & Wart Removal Pen NOT be used? For removing warts on children under the age of four.